Woke up on Day 5 to recount day 4. I wrote a ton of detail but due to poor internet connection it didn’t save – complete user error as I tried to send it to Twitter before hitting save. Wish I had backed that up. To quickly detail the day I’ll keep it in bullets – quicker and I want to see Rushmore and Crazy horse this morning. Met an ex-con sitting outside my MN hotel who was applying for a job. He spent time for a “domestic assault” but “it wasn’t his fault. Did some Meth since being released but it’s ok because he’s not an addict.” Everybody deserves a second chance but I’m not holding out much hope for this guy. Still not owning up to his actions. I’m glad we met and spent so much time talking – also hate to be judgmental but it’s sad when something is so clearly wrong and somebody doesn’t see it. On the road: Speed limit here is 75 in most places and no stoplights. The ride went by pretty uneventfully despite the 4 roadside cops through the 600 mile ride. 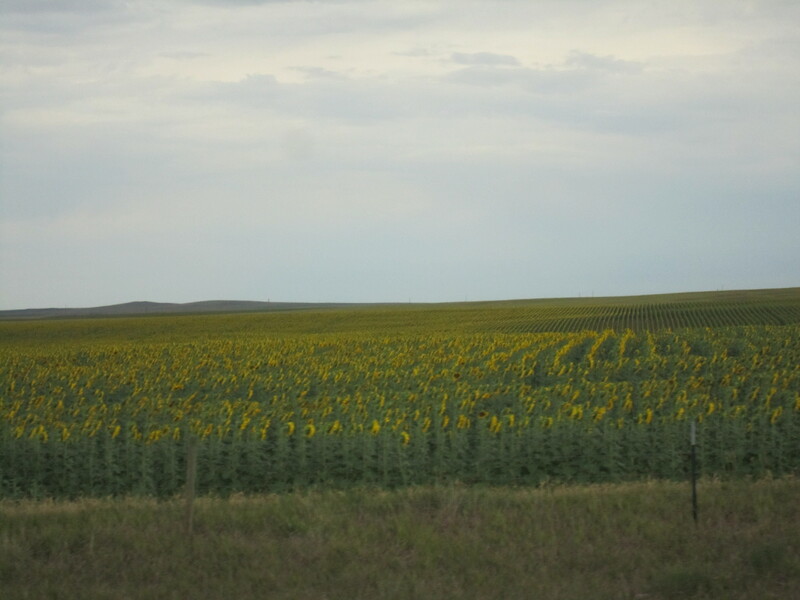 One scene that stuck out was that between the long stretches of corn (it was everywhere) I encountered a 1 mile stretch of sunflowers. Really incredible sight! The Steve Jobs Audiobook kept me entertained through the long stretches of road. Really Badass biker audio. The only issues were a hail storm headed my way and almost running out of gas in the Badlands. I tried to take refuge from the potential hail storm at a gas station. I asked the attendant when they last saw hail. He laughed and said “May – and was laughing because they just had the holes in their ceiling fixed. Apparently this wasn’t my safe refuge. The gas issue was due to the stations where I stopped only stocking 87 octane which is not great for bikes. I opted to carry on to the next station 20 miles toward the Badlands. I was slightly stressed that the station would be closed and I’d have to figure out a plan B.
I arrived in Rapid City SD, checked into the hotel and did a quick load of sink laundry. My riding jeans were so full of pollen that the sink was filled with water the color of yellow Gatorade, even after the third rinse. Went to Sturgis – 30 miles from the hotel. This place is just unbelievable – almost overwhelming. 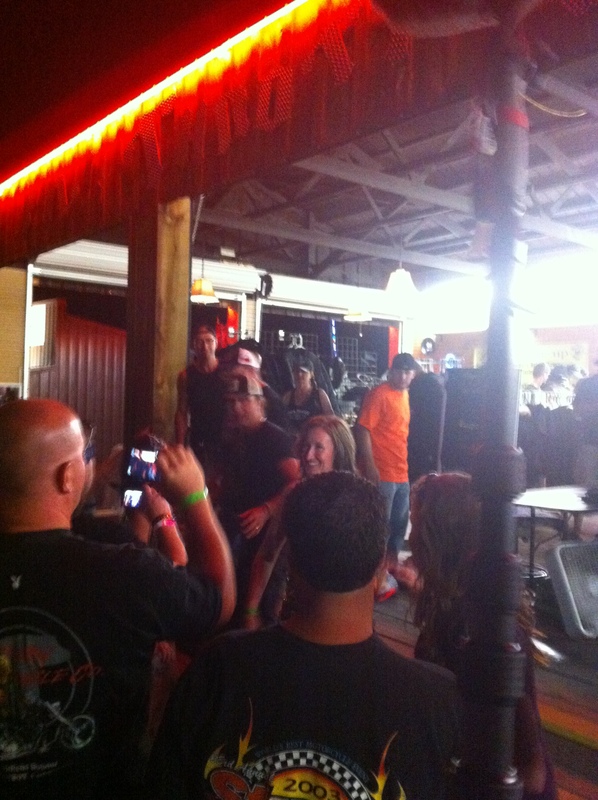 The Full Throttle Saloon (from the TruTV show) was much bigger than I had expected and the 80s Hair Band Cinderella played with special guest Sebastian Bach (from Skid Row). This music brought back memories of simpler times – times where I tried and failed to grow a mullet. Clearly some of the other patrons hadn’t experienced that same failure and continue to showcase their mullet-based success even today! This bar and all of Sturgis is more than I could have expected – truly phenomenal and the people were all incredibly friendly – many of whom helped add to the next day’s ride itinerary. Midnight seemed like the right time to leave. I would ride 30 miles back to the hotel watching countless roadside sobriety tests along the way. 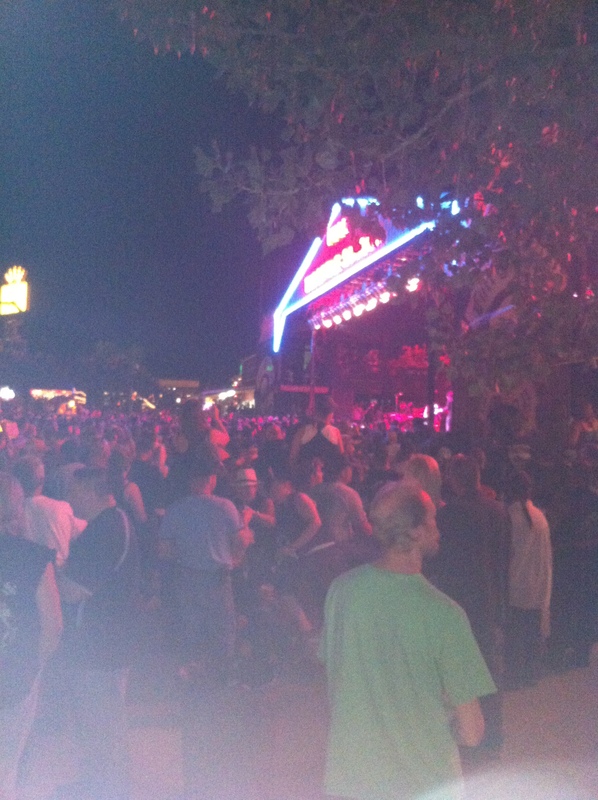 Sturgis 2012. I rode mine there.